Shared by Twitter user @samkalidi. The meme was created from the mobile video which captured Ahmed’s execution. A prescient article received before the tragic events in France this week, suggests three pressing reasons for the European Union to re-establish its role as a peacebuilding instrument in the minds of the general public. The family of slain Muslim police officer Ahmed Merabet is urging people not to equate Muslims with extremists, following a string of deadly attacks in three days in Paris that left 20 dead and the city reeling. Based on this statement alone, it looks like France is about to fall into a Red Queen’s Trap. In this case, an all consuming struggle between an increasingly hollow nation-state and a large and growing population of people unwilling to assimilate. For example: here’s agovernment list and atlas of the 751 “sensitive neighborhoods” like the one below that won’t assimilate. Freedom of Speech – Zacqary Adam Xeper: The cartoonists at Charlie Hebdo did not deserve to die. As a believer in free speech, I’m now supposed to go beyond that sentiment and lionize them as martyrs, fearlessly expressing themselves and standing up for the principles of freedom. I can’t do it. I will mourn for their deaths but I will not glorify their hate speech. A week ago, Charlie Hebdo was anything but a household name. On Wednesday, after the appalling terrorist attacks in Paris, all of that changed. Police in France are urgently hunting for any accomplices of the gunmen who killed 17 people in two days of terror attacks around Paris. Caroline Fourest worked at Charlie Hebdo when it re-published the cartoons of the Prophet Mohamed. 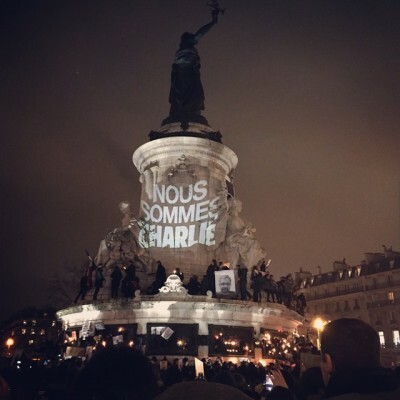 Karima Bennoune interviewed her for openDemocracy on the day of the Paris attacks. There is a disconnect between the teachings of the Qur’an and much of the Muslim population’s understanding of the Qur’an. How do we address and resolve this issue? This was a specific attack designed to sow division. We musn’t let it. The horrific killing of ten journalists and two policemen in Paris on Wednesday has been widely described in the mainstream media as a ‘murderous attack on Western freedoms’, notably freedom of expression and the right to satirise. In response, some bloggers have insisted that the ‘attack had nothing to do with free speech’ but was simply part of the ongoing war between Western governments and jihadists. A member of al-Qaeda’s offshoot branch in Yemen, known as al-Qaeda in the Arabian Peninsula or AQAP, told The Associated Press on Friday that the group directed the deadly attack on the French magazine Charlie Hebdo. How Muslim are the Muslim terrorists? If a person chooses to identify as a Muslim, we do not question her identity because that is disrespectful, especially if we are not Muslims ourselves. Was the recent murder of 12 people at Charlie Hebdo, the French satirical paper, an act of Islamic terror? Or was it just terror, without a religious or identity character? Beneath the simplistic binary claims that the act does not represent Muslims and Islam, or that Islam is to blame altogether, there lies a difficult and important dilemma: How should we refer to the identity of the perpetrators of this, and other similar acts of terror? Should we consider them Muslims or not? In solidarity with the people killed in Paris, this illustration is accompanied by the caption, “Break one, thousand will rise,” as part of the #JeSuisCharlie hashtag. Many people and media outlets have been sharing this illustration by Lucille Clerc but incorrectly crediting Banksy. Credit: Lucille Clerc License: All rights reserved..
Screen grab from Journalist Ahmed Shihab-Eldin’s Facebook page. I participated in the online support campaign #JeSuisCharlie and I still support all attempts, by anyone, to highlight the importance of freedom of speech. Debates over what limits to free speech are acceptable are entirely valid – whether or not we approve of Charlie Hebdo images, or their mass republication on numerous websites this week. Since Wednesday’s horrific terror attack on the satiricial magazine Charlie Hebdoin Paris, the phrase “Je Suis Charlie” (I am Charlie) has become a rallying cry of solidarity across the globe. On Friday, French security forces killed the two brothers — Cherif and Said Kouachi — suspected of murdering 12 people in an attack on the French satirical magazine Charlie Hebdo. The suspects were killed after an hours-long standoff with police near the Charles de Gaulle Airport. French President Francois Hollande on Friday referred to a deadly attack on a kosher market in Paris as an “anti-Semitic act” and urged France to remain “implacable” in the face of racism. After an hours-long standoff with French police near the Charles de Gaulle Airport outside Paris, the two brothers suspected of killing 12 people in the attack on the Charlie Hebdo magazine are dead, officials say. Another gunman who took multiple hostages at a kosher market in eastern Paris was also killed in a police raid. Police are still searching for a fourth suspect, a woman.